Vinyl - Lets Discuss The Issues. Submitted by Zebra Mussel on Mon, 02/20/2006 - 22:55. Submitted by Zebra Mussel on Mon, 02/20/2006 - 23:05. Submitted by Zebra Mussel on Mon, 02/20/2006 - 23:13. Washington, DC - The Healthy Building Network (HBN), an environmental advocacy organization, today denounced proposals drafted by the US Green Building Council (USGBC) that advance the interests of chemical and timber industry trade groups at the expense of growing market trends favoring safer and healthier building materials. In late December, a USGBC task force considering whether to offer a credit for PVC elimination under its LEED green building rating system issued a draft report concluding that PVC "does not emerge as a clear winner or loser" as a green building material. The task force adopted recommendations of industry trade groups, and rejected approaches recommended by environmental health experts. "The USGBC's proposals utilize discredited 'cigarette science' to undermine leaders in the green building field, contradict established environmental policy goals, and threaten emerging market trends moving away from PVC, the worst plastic for the environment," said Bill Walsh, National Coordinator of HBN. The USGBC's draft finding contradicts decisions industry leaders such as Kaiser Permanente, Shaw Carpet, and McDonough Braungart Design Chemistry, green building leaders that have taken steps to eliminate PVC, the world's largest material source of dioxin, the most toxic substance known to science. PVC or vinyl plastic has become a major building material, used for pipes, flooring, wall coverings, and more. Because production, use, and disposal of PVC poses substantial environmental and human health hazards, national, state, and local governments, manufacturers, and green building professionals have eliminated certain uses of PVC for environmental reasons. A separate USGBC task force proposed the recognition of timber industry wood certification standards condemned by forest conservation groups and leaders in the sustainable wood products business. This will undermine the widely accepted Forest Stewardship Council (FSC) certification of wood products. "PVC and wood from clearcut forests are the antitheses of green building materials. By endorsing their use, the USGBC is risking its leadership in the field," said Walsh. Public comments on both draft proposals are due in February. Corporate Policies of PVC Phase outs! Submitted by Zebra Mussel on Mon, 02/20/2006 - 23:18. Corporate Policies: The following companies have made commitments to the eventual phase-out of PVC plastic. How far off base could all of these folks be? I thank John McGovern for getting me all ramped up about this, his post elsewhere remided me what a great home RealNeo would be for one of the HOTTEST debates within the green building movement. What are the issues with vinyl? Submitted by Norm Roulet on Tue, 02/21/2006 - 01:00. In reading the press release you posted to this forum, I now know PVC is the leading source of dioxin in the environment, but I really don't know much more. Please give me a short explanation of what is important to know about PVC - especially regarding my day to day life and the health of my family and community - and what should I do about it? What should our NEO community do about it? Submitted by Zebra Mussel on Tue, 02/21/2006 - 23:30. Of the 10 billion pounds of polyvinyl chloride (PVC) resin produced annualy in the U.S., 60 percent is used in construction. The production of plastic accounts for the single largest use of chlorine and PVC is the most common of all chlorinated plastics. (Chlorine is bad mmmm kay). Vinyl chloride, the chemical used to make PVC is a known human carcinogen, according to the World Health Organizatinon's International Agency for Research on Cancer (IARC). The manufacture of PVC also creates and disperses dioxins (organo chlorine compounds), which include the most toxic man-made chemical known. Released into our biosphere dioxins enter our food chain, where they bioaccumulate in fatty tissues of animal including humaniods. This is one of the reasons we can only eat X amount of meals of fish per month out of lake erie. Bioaccumulation of dioxins in fatty tisssues throughout the food web is so pervaisive that hte U.S. EPA estimates a 1 in 1000 chance of contracting cancer from dioxin exposure through a typical american diet. Dioxin may also affect childrens development and damage immune functions. PVC food packaging can include plastic trays, candy bar wrappers, and bottles. Cling wraps, especially the kind used commercially to wrap meats (saran wrap) can also be PVC. Unforutnatly this means exposure to not only PVC related compounds but also to phthalates (chemicals used to soften the plastic). PVC is commonly used in teethers and soft squeeze toys in the USA (it is banned in EU for this application). In the good ol USA we also use it for beach balls, bath toys, etc. Health concerns for children who play with PVC lifestyle accessories often center aroudn toxic softners known as phthalates. What should you do about it? Get smart and seek out alternitives. Your car makers are phasing it out of production.. why are you not phasing it out of your household? If you get stumped on your new mission in life to erradicate PVC from your personal space.. just email me. I have a a shelf full of PVC free building supply samples, and a lot of friends who dont like it more than i do! NE Ohio can also be weary. Be weary and mindful of greenwash because PVC is at the very leading edge of the greenwashing trend. In short, see the movie, buy a hemp or organic cotton shower curtain, and email me if you cant figure out a pvc free alternitive for something or other. I have books on it. Case closed? Not yet. ps my paragraph breaks never work in here. Submitted by Norm Roulet on Wed, 02/22/2006 - 01:39. You got me on shower curtain, kids toys, plastic wrap. I'll be more attentive to PVCs in personal decisions. Is this also something communities can get active about - are there PVC-free initiatives anywhere... what do they look like and do? Biobased polymeric technology? So is that found in products now - how can I know what is what? RE; Paragraph breaks - for some reason you need to put two returns between breaks in the comments - we're looking into that. Submitted by Zebra Mussel on Sat, 03/04/2006 - 00:24. ALBANY, N.Y., June 3, 2003 - In a victory for the growing movement of environmentalists, local governments and companies working to avoid the use of hazardous vinyl plastic (also known as polyvinyl chloride or PVC), the vinyl industry have dropped their lawsuit contesting New York State's refusal to recognize vinyl flooring as a "green" building material. The lawsuit had been scheduled to be heard before the state Supreme Court on June 6. "There's nothing green about vinyl. It's a highly toxic product that contaminates our homes, bodies, and the environment," said Paul Bogart of the Healthy Building Network. "Other states should take note of New York's victory and implement policy changes to reduce the use of vinyl." The Resilient Floor Covering Institute, a flooring trade association, abruptly withdrew its lawsuit just one week before presenting its case asserting vinyl flooring is a "sustainable" product that should be eligible for the state's Green Building Tax Credit program. New York State had rejected vinyl flooring for the program based on the product's substantial environmental problems, including creation of dioxin, which has been identified as the most potent carcinogen on earth. Vinyl flooring is not banned under the tax credit; builders and consumers are still free to choose these products, however it will not be eligible for a tax credit. There are many viable alternatives to vinyl flooring with a lesser environmental impact. Vinyl is the worst plastic for the environment and human health. 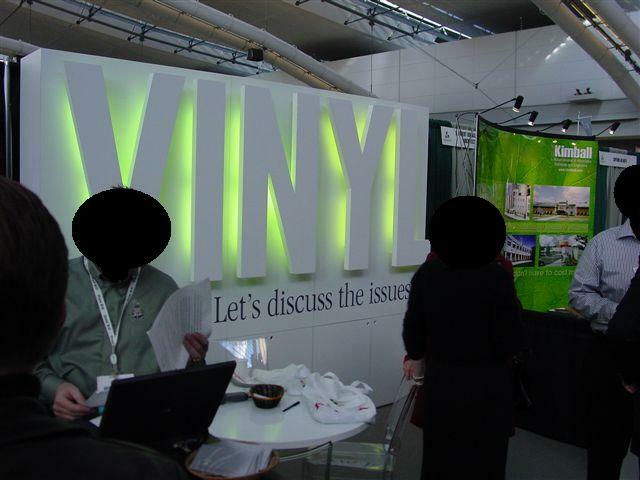 New York State is at the forefront of a movement to end the use of vinyl, particularly in building construction, which accounts for 75 percent of all vinyl plastic manufactured, including pipes, flooring, windows and roofing. For example, the City of Seattle has an official policy to reduce the use of vinyl, and the City of San Francisco is considering policies that will favor alternatives to vinyl plastic. Healthcare giant Kaiser Permanente is eliminating vinyl from many medical products and its hospital facilities, and dozens of other major building projects including the U.S. Environmental Protection Agency headquarters in Washington, D.C., and the Sydney Olympics, have reduced vinyl plastic in favor of greener products. Submitted by Zebra Mussel on Sat, 03/04/2006 - 00:29. Submitted by Susan Miller on Mon, 10/29/2007 - 22:35. I remembered this discussion on realneo when I found this article and wanted to add it to this thread of hot vinyl discussion. Here from Preservation Nation. Why can’t President Obama fix this park picnic table?